According to Winslow, Napoleon was bred by a French Nobleman and was born at the Chateau Fontainebleau, near Paris in 1888! "His mother was a very famous cat, and his grandmother was one of the grandest dams in the country. The latter apparently lived and flourished up to the age of nineteen years and consequently Napoleon the Great is considered by his owners as a mere youth. "1 His owner is listed as Mrs. Charles Weed, of Woodhaven, Queens Co., New York. Helen Winslow herself gives two contradicting reports on the colour and pattern of 'Juno'. 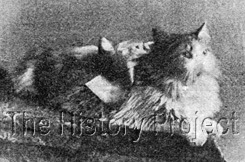 In her book Concerning Cats(1900) she is described as a Tortie & White, but in an article written by Winslow two years earlier, for The Bazar, in 1898, 'Juno' is described as a Brown and White. 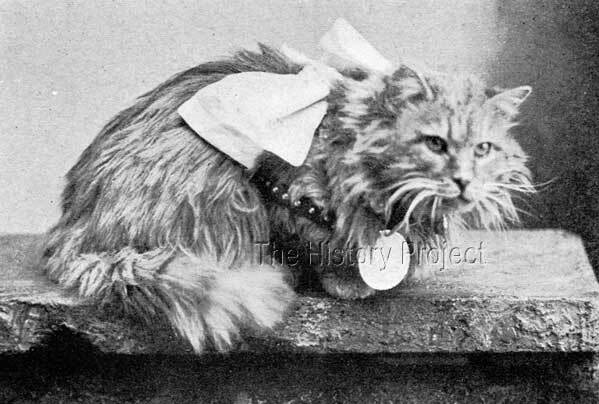 In the records of The U.S. Register and Studbook for Cats, we find more references to the progeny and grand-progeny of 'Napoleon the Great'. The most prominent of these is a cat named 'Bunch' a red tabby male sired by 'Napoleon' and out of an unnamed Red and White dam. 'Bunch' (USR, 37) is recorded as born in New York, in 1894 and appears to have been purchased by a syndicate which included Mrs. Cora L. Norton, Mrs. Edith Talbot, Mrs. Chas. S. DeWitt, Mrs. F.W. Story. Interestingly, although registered as an Orange Tabby (Red Tabby) it is noted on his registration that he only had slight markings, which would suggest that he was closer to being a 'self-coloured' red.3 His photo is given here. 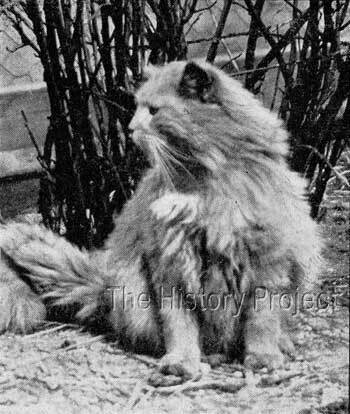 It is in fact, through a son and daughter of 'Bunch', namely a male named 'Naulahka' and a Tortie female named 'Scamp' (BCC: 296) who when bred together in 1900 produced 'Prince of Orange', who holds the distinction of being the first Orange Champion cat in the United States.